There's a good chance that you, reader, have seen the movie Love, Simon by now or that you at least are greatly aware of it. The movie has been in theaters since March 16th, and it started quickly gaining attention from the public even BEFORE it was released. Love, Simon (based on the novel Simon vs. the Homo Sapiens Agenda) is a pretty picture of the all-american teenage years, with a slight twist- the main character (Simon) is gay and, for reasons he can't really explain, deathly afraid to come out. After not being given much of a choice (spoiler alert! ), Simon's Extremely Normal life is shaken, but ultimately changed for the better. I, for one, adored this movie. I enjoyed everything, from the heartwarming message to the hint of mystery that had me racing to guess who Simon's secret pen pal was until the very end (for the record, I was right). The movie packaged humor, suspense and romance brilliantly while managing to remain remarkably normal (in a charming, relatable way). 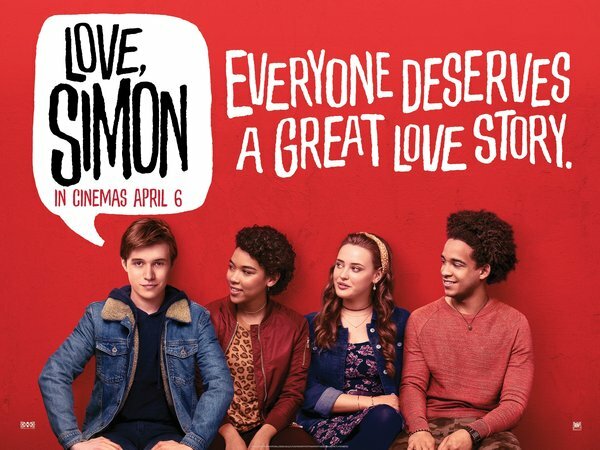 I'm not the only one who loved it, of course- Rotten Tomatoes gave Love, Simon a 92%. Not too shabby! Amidst all the buzz, Vice recently named Love, Simon 2018's breakout teen film. It has reportedly gained more online attention (from Twitter, among others) than Call Me By Your Name and Moonlight combined. The movie has done more than entertain- it has provided something for LGBTQ+ young adults to relate to simultaneously. Various celebrities have even gone as far as to buy out ENTIRE theaters for Love, Simon. The love is abundant.